At Capitol Dentistry in North Toronto, we know that dentist appointment can cause anxiety. Our caring team of professionals offer sedation options, which are designed to help anxious patients manage their fears. One reason that many people avoid the dentist is fear. While skipping regular check ups may calm your nerves, it can have quite a negative effect on your oral health. The good news? Your team at Capitol Dentistry offers sedation options. Sedation is recommended for patients with dental anxiety or other conditions. The type of sedation will depend on the severity of the anxiety. Nitrous Oxide Sedation: Better known as laughing gas, this type of sedation is administered to relax the patient before dental work starts. Again, since it does not relieve pain an anesthetic is also administered. IV Sedation: IV dental sedation induces a deep sleep-like state. The sedative is administered into your blood stream and works quickly. Within seconds you'll feel relaxed and drowsy. General Anesthesia: While we don't offer general anesthesia at our office, we can arrange for a local practice to provide you with the sedation treatment you require. Why consider sedation at my next appointment? Sedation is designed to relax the patient enough to manage the anxiety that is often associated with going to the dentist. Oftentimes, we can complete multiple procedures in a single visit cutting down on the number of times a patient needs to visit the office. There are a few precautions that need to be taken with sedation. For example, we monitor the patient's heart rate and breathing for the duration of the visit. It is important that a patient has someone take them to the appointment and pick them up after their appointment as the anesthetic might last for a few hours after the procedure and pick them up after their appointment as the anesthetic might last for a few hours after the procedure. 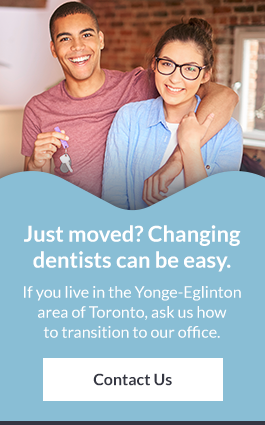 Ask your dentist if sedation is right for you the next time you visit our Yonge and Eglinton dentist office. Is sedation for dentistry covered by insurance? Since everyone's insurance is different, it is best to contact your provider to see what is available to you.